Shred all the vegetables. Beat in the egg and salt. Heat enough oil to cover the pan. 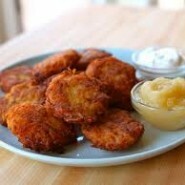 Fry each latke until brown and then flip. Enjoy! Now, could Rena Reiser be some how related to me? My family came to USA in about 1870 from Romania. My g-g-grandfather was Charles/Karl Reiser.